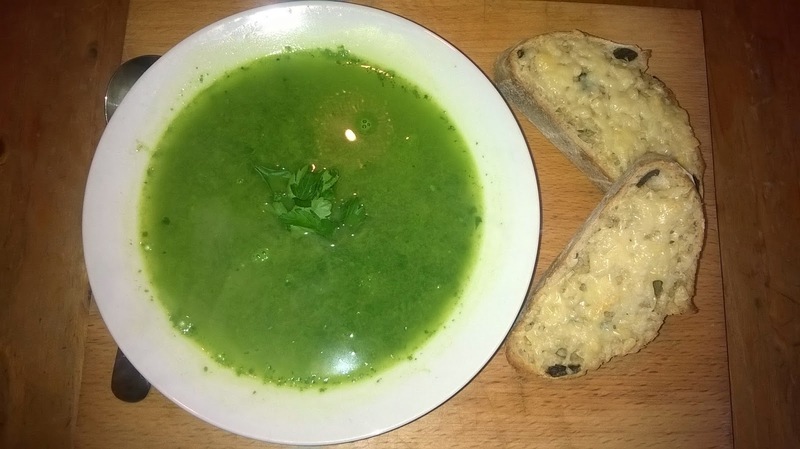 This is an extremey easy ‘Green Goddess’ type soup which takes less than 10 minutes to make. With very few ingredients, and all of them natural and healthy, this is a great soup to make when you’re on a health kick. It also has limited calories, so would make a super fast evening meal for anyone on the 5:2 diet. Of course, I had to ruin all of that health with two scrummy slices of cheese on toast, but you can omit these if you’re better behaved than me. This will make at least 4 portions of the soup. 1. Chop the onion and add it to a large saucepan with half a tablespoon of sunflower oil, on a medium heat. Soften for 2-3 minutes. 2. Pour in the vegetable stock, bring to the boil and add all of the watercresss. When the watercress has wilted, stir in the nutmeg and some salt and pepper, then turn off the heat. 3. Meanwhile, grate the gruyere and top the bread with it. Pop under a grill on a high heat until golden. 4. Add the parsley to the soup, then use a food processor to whizz the soup into a smooth consistency. You could add a spoonful of ricotta to the middle of each bowl of soup.